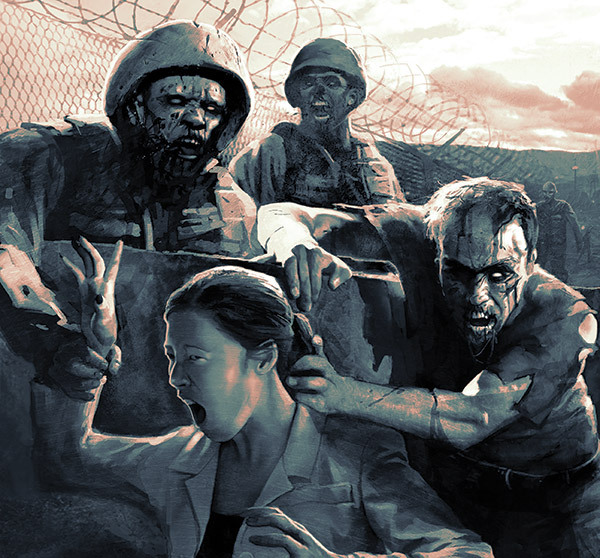 In Fantasy Flight’s new role-playing game, The End of the World, your friends have come over to play games when a zombie outbreak occurs. The characters are the very people at the table; your starting equipment is whatever you can grab before zombies force you from the gaming table. Your goal isn’t to find the cure or eradicate the zombie outbreak in your town. You must survive. The first dramatic moments come before the game even begins. Character creation, at least for us, was emotional, revelatory, and unsettling. Each player has 10 points to rate themselves on six traits representing offensive and defensive prowess in physical, mental, and social abilities. This is on a scale of 1-5, with 1 being “Aunt May” and 5 being “No one you actually know.” You start with 1 point in each for free and, in general, people end up with a few 2s, a few 3s, and maybe one stat that’s a 4. Here’s where things get awkward. There’s a secret vote for every player’s pair of traits in the physical, mental, and social categories. This vote determines if the player overrated or underrated themselves. Underrating your ability earns you a bonus stat point to spend, while overrating it dings you a point. It stings to know your friends think you’re even less physically capable than the puny ratings you gave yourself. One friend looked crestfallen at learning that his best attribute was not, in fact, his sardonic wit. Next up, each player creates one positive and one negative feature for the three different core traits. For physical you might be a “Great Swimmer," but also a “Smoker.” The voting results play a factor here to help balance the game. If you were able to add a point in a trait due to voting results, you must add a second negative feature. If you lost a point, you can add another positive feature. Your mission is not to save the world. The world is hosed. Just survive as long as you can. The Dead Live... Well, They're Still Dead, but are Like, Walking Around... You Know What I Mean! As soon as character creation ends, the zombie apocalypse begins. 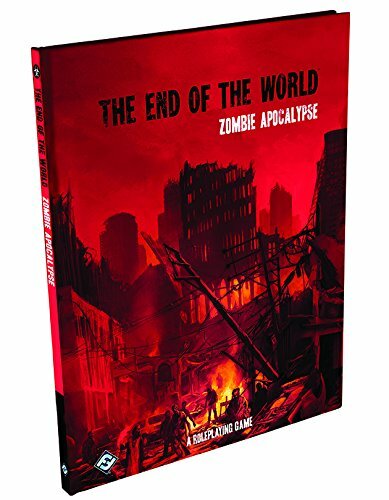 The End of the World has five different zombie scenarios. These are not detailed campaigns with point-by-point steps on what happens. 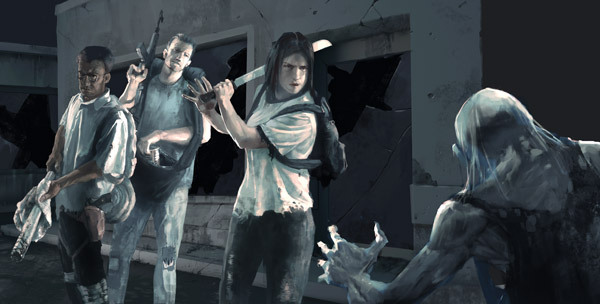 Instead, each scenario describes how the zombie apocalypse begins, gives rules to the zombies of that scenario, and offers some example stat blocks for what people may encounter. There are some helpful ideas for encounters at different places players might end up – the mall, a farm, etc. – but this is laregly a free-form gaming experience. And it is amazing. Consider all the various zombie movies, TV shows, and books you’ve consumed. Not all zombie apocalypse’s are created equal. There’s the standard zombie outbreak, the one where the undead move slowly, infect with their bite, and only affect humans. But that’s not the only type of zombie apocalypse around. There are zombie movies with quick-moving undead, where anyone who dies rises to join their unholy ranks, and where bites don’t transfer any sort of infection. It might be a virus or it could be that Hell ran out of room. There are five possibilities, with different zombie rules and different implications on how the world will end. The players don’t know what they’re running into. For our game, which took place on New Year’s Eve (because we know how to have a good time), zombies didn’t work as our group expected. A meteor shower from earlier in the night had irradiated Salt Lake City and brought the dead back to life. All dead. Including animals. Being bitten isn't what turns you into a zombie; it's the dead who rise, no matter how they meet their end. But, again, only the GM knows this. The players make assumptions and learn through experience. Our story began with a man behind attacked by zombie dogs. He stumbled into our home, forcing everyone into action. Adam, the athlete, tried to smother the dog under a table. Alana, the nice one, sprayed dish soap in its eyes. My wife tried to club the dog while it was distracted by the others. All in an attempt to subdue or kill the dog before it could finish off the stranger. The combat, like all conflicts in the End of the World (physical, social, or mental), is simple. Create positive and negative dice pools based on the circumstances, difficulty, and any impacting features on your character sheet. Each negative die that matches a positive die cancels each other out. Have at least one surviving positive die that is equal to or lower than the player stat being tested and the action's a success. But even success can come at a cost. All remaining negative dice - whether you failed or succeeded - add some amount of stress in the trait you were using. Stress is “damage” in The End of the World and it builds up quickly. In the conflict, my wife was bitten by the dog. A deep wound that caused five stress to her hand. You can have a maximum of nine stress in any category before, well, let’s not think about bad things. Once you have a calm moment to assess the nature of the stress, you can convert it into a treatable trauma. After the dog was brained, my wife washed her hand, cleaning the wound and assessing the severity. She erased the stress and turned it into a physical trauma “Hurt right hand.” Traumas act like negative features, meaning anytime my wife needs to use that right hand she must add an extra negative die to her roll until her hand has time to heal. But traumas, even social ones, can heal over time. Our friend, Adam, noticed Laura was bitten. And, as we learned later, Adam is someone you do not f*** around with during a zombie apocalypse. After killing the first wild dog, everyone had two minutes to grab what they could and flee our home. Immediately, there was tension. More tension than I can ever remember in an RPG. It felt like a zombie apocalypse. Zombie dogs were not what anyone expected. Neither were the hundreds of zombie cockroaches that crawled out of the sink as my wife cleaned her wound. The group fled in a car, trying to get to a nearby workplace where food supplies would be plentiful and there was a real deal 40-pound sword perfect for decapitating zombies. They made it halfway to the office before running across a pair of undead horses. We may have experienced a truly one-of-a-kind RPG moment at that point. A car chase involving a pair of undead horses determined to get at the tasty morsels inside. After spinning out and nearly being wrecked by the horses, the group managed to escape. But now, everyone was freaked out. There was no “role-playing” in this moment. These players were genuinely unnerved. It was at the office where true colors were revealed. Forced to take the stairs to the third floor, the crew came across a man, wounded and asking for help. He had blood on a wound across his stomach, his hand trying to stem any further blood loss. He was pale, weak, shaken. A debate broke out among the group. What would you do? Help him? Leave him? Worse? Adam interrupted the argument. “I’m sorry, guys,” he said, pushing his way forward. It sounded like he was not going to allow any act of cruelty, that he could not let this man die without at least assessing his wounds. Everyone stepped back. Adam was the voice of reason. And then, Adam drove a chair leg through the man’s skull and killed him. “He was dead anyway,” sums up Adam’s reasoning. Everyone at the table slowly edged away. My wife unconsciously covered her hand, which wasn’t actually wounded. The adventure continued, with the group gathering supplies and making a plan to hunker down. As the GM, I couldn’t let that last long. I did what I could. I sent zombie pigeons crashing against the windows. The office cleaners showed up to steal supplies, forcing the first social challenge. A zombie waited in a darkened bathroom and was the first to feel the wrath of the sword. We had to call it quits shortly after midnight. It was getting late and no one seemed to want to face what was to come. There was no hope. Someone in the group would end up dying, likely at Adam’s hand. That’s the kind of thing that could kill a friendship. The End of the World is a different kind of RPG. You play as a version of yourself, but there's no denying you are just playing a game. Would Adam really have brained an innocent man if faced with a zombie apocalypse? Probably not. But being “yourselves,” in your town, creates an enhanced level of immersion. Afterwards, you might look at your friends a little differently. And, as we found, you might begin to reassess your survivability in a crisis. I’ve come to accept that, as in the game, I’m probably going to die by being eaten by a thousand zombie cockroaches. And I’m learning to be okay with that.